Hello. I found this script. It works in Editable poly, but it does not apply in Edit Poly, so I want to know the solution. I tried various experiments while viewing the Max script help, but it is not good because I am a beginner ... I apologize for any inconvenience caused by using a translator. Submitted by chesa on Thu, 2018-01-11 13:22. I do not mean applying material to an existing mat id. I mean that the selected polygon is created with a random ID and color applied each time. If you use this script with a shortcut key, editable poly will be applied similar to specifying poly group in zmodeler of zbrush. 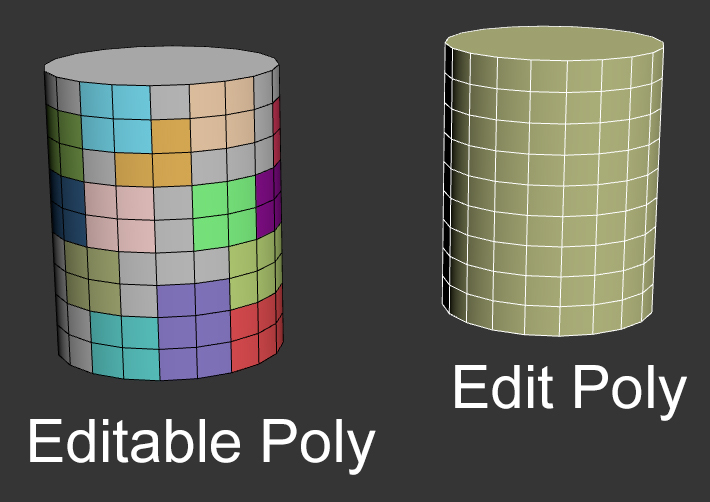 However, edit poly does not create a new mat id and random color on the selected polygon. Originally I tried to use this script, but in 3dsmax 2017 it did not work and I was trying to figure out something else. I'm sorry I did not get the explanation right. And thank you for your reply. Submitted by ZalitZ on Fri, 2018-01-12 06:14. In fact there seem to be a difference between the two. With Editable poly you can use Polyop methods but not with the modifier :"All polyOp methods take as an argument , the poly to operate on. This argument can be either a node value where the base object of the node is an Editable_Poly, or the Editable_Poly base object." Submitted by ZalitZ on Wed, 2018-01-10 06:04. Are you sure the Edit Poly one has different face IDs ? There shouldn't be any difference between a converted Editable Poly and the Edit poly modifier (I could be wrong though). I rewrote the script. You should try this.